The hip hop world got a slice of the Midwest when XXLMag.com gave Stevie Stone’s “808 Bendin” featuring Tech N9ne its official world premiere this week. Loud, heavy, and unapologetic, “808 Bendin” puts Stevie Stone in the spotlight as he drops some heated bars over thumping production straight out of an 808 lover’s fantasy. 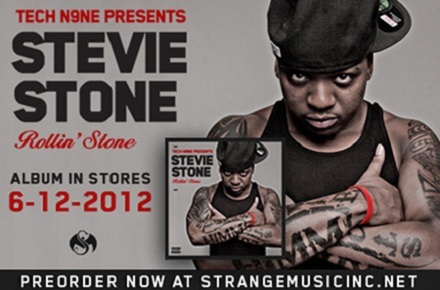 Joined by Tech N9ne, Stevie Stone delivered the quality banger that fans have come to know him for and now thanks to XXL‘s support, new listeners everywhere are catching on to the rugged Midwestern emcee. With Stevie Stone’s Rollin’ Stone less than a month away, folks all over the web are sure to get STONED with “808 Bendin”. What do you think about the feedback for “808 Bendin”? Are you on board with it?